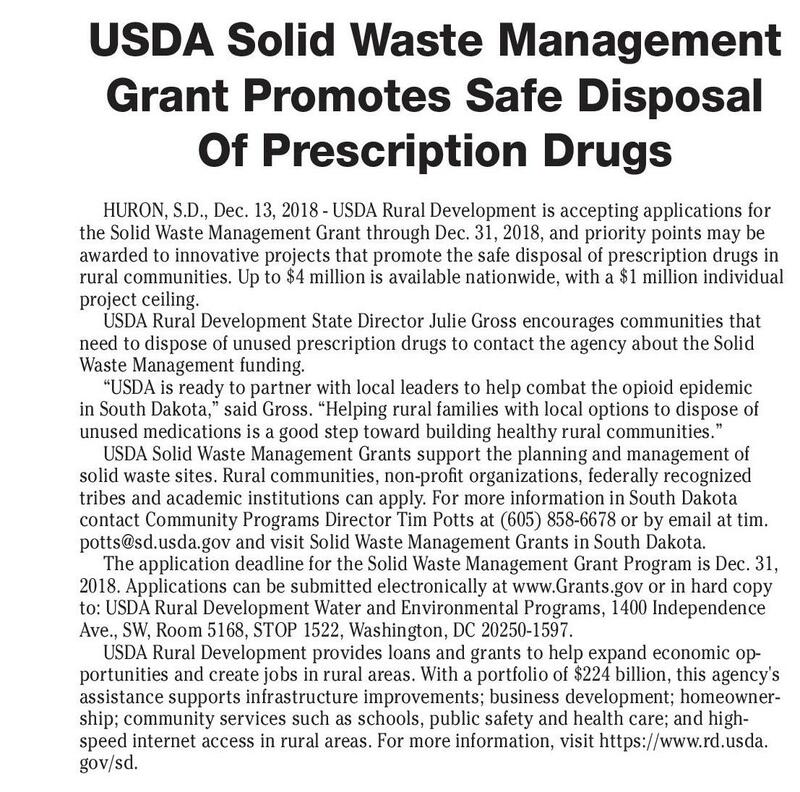 6 Broadcaster Press Decemeber 18, 2018 www.broadcasteronline.com USDA Solid Waste Management Grant Promotes Safe Disposal Of Prescription Drugs HURON, S.D., Dec. 13, 2018 - USDA Rural Development is accepting applications for the Solid Waste Management Grant through Dec. 31, 2018, and priority points may be awarded to innovative projects that promote the safe disposal of prescription drugs in rural communities. Up to $4 million is available nationwide, with a $1 million individual project ceiling. USDA Rural Development State Director Julie Gross encourages communities that need to dispose of unused prescription drugs to contact the agency about the Solid Waste Management funding. “USDA is ready to partner with local leaders to help combat the opioid epidemic in South Dakota,” said Gross. “Helping rural families with local options to dispose of unused medications is a good step toward building healthy rural communities.” USDA Solid Waste Management Grants support the planning and management of solid waste sites. Rural communities, non-profit organizations, federally recognized tribes and academic institutions can apply. For more information in South Dakota contact Community Programs Director Tim Potts at (605) 858-6678 or by email at tim. potts@sd.usda.gov and visit Solid Waste Management Grants in South Dakota. The application deadline for the Solid Waste Management Grant Program is Dec. 31, 2018. Applications can be submitted electronically at www.Grants.gov or in hard copy to: USDA Rural Development Water and Environmental Programs, 1400 Independence Ave., SW, Room 5168, STOP 1522, Washington, DC 20250-1597. USDA Rural Development provides loans and grants to help expand economic opportunities and create jobs in rural areas. With a portfolio of $224 billion, this agency's assistance supports infrastructure improvements; business development; homeownership; community services such as schools, public safety and health care; and highspeed internet access in rural areas. For more information, visit https://www.rd.usda. gov/sd. 1360 Great benefits and earning potential. Career opportunities available upon completion of training program. Bachelor’s degree in a business field preferred, but not required. Must be open to relocation. Add’l $3.00 per hour for weekend hours. Apply in person at: 3210 Broadway Ave Yankton SD, 57078 Nursing Positions Immediate openings for full-time positions in Family Medicine, Float and Internal Medicine departments. Individual must have the ability to prioritize, adapt quickly to changing situations, and work efficiently; have excellent communication and computer skills. Must be flexible with schedule, display a professional attitude and be a “team” player. Must possess current South Dakota nursing license. All qualified applicants will receive consideration for employment without regard to race, color, religion, gender, national origin, age, disability or veteran status. 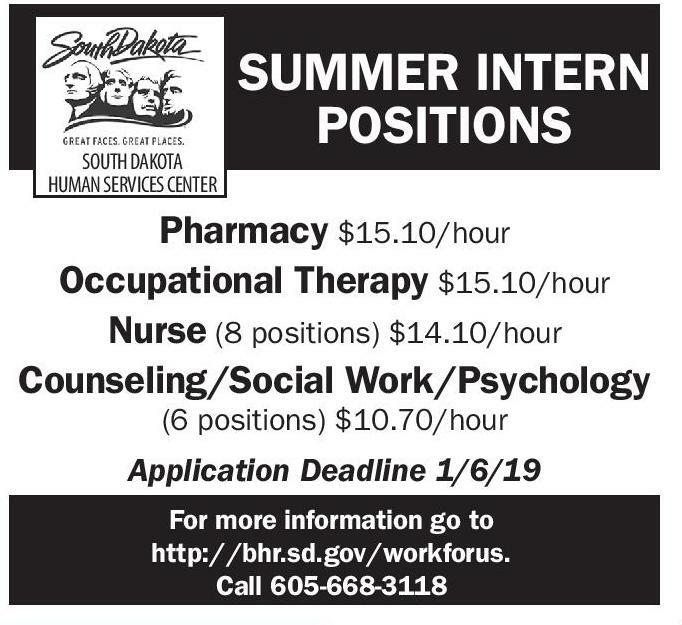 1104 West 8th Street Yankton, SD 57078 IF INTERESTED, APPLY ONLINE AT: www.YanktonMedicalClinic.com/careers Are you a Class A CDL Driver and tired of getting jacked around by employers? Call me to see why our turnover rate is so low. Scott 507-437-9905 Apply: WWW.MCFGTL.COM (MCN) comes to RESULTS There is no Equal The Broadcaster 624-4429 201 W Cherry • Vermillion Income Opportunity 1360 Become a Published Author. We want to Read Your Book! Dorrance Publishing-Trusted by Authors Since 1920. Book manuscript submissions currently being reviewed. Comprehensive Services: Consultation, Production, Promotion and Distribution. Call for Your Free Author's Guide 1-855520-9045 (MCN) Income Opportunity Herd Co. Feedlot near Bartlett, NE has immediate openings for general and skilled labor. General labor starting wage offered at $15.00 per hour with skilled labor wages based on work experience. Offering full benefits, including Health, Dental and Vision insurance, paid vacation and sick leave. Call 402-4825931 for more information. Ask for Chad or Brenden. Read and Recycle ' 3 HDGOLQHV Classified Ads: Friday at Noon Display Ads: Friday at 11AM NEW AUTHORS WANTED! Page Publishing will help you self-publish your own book. FREE author submission kit! Limited offer! Why wait? Call now: 855-623-8796 (MCN) Patient Accounts Representative: Full-time position (40 hours per week) Monday through Friday. Assists patients with questions regarding their financial health care accounts. Monitors and reviews patient’s financial responsibility. Experience in billing cycles, customer service and collections required. Medical terminology preferred. . All qualified applicants will receive consideration for employment without regard to race, color, religion, gender, national origin, age, disability or veteran status. Nursing Supervisor Immediate opening, full-time. Will supervise, plan develop and organize nursing services and activities. Will be responsible to train and recruit employees, monitor and evaluate performance and ensure operational productivity. Will participate in nursing schedule wherever necessary. Must have current SD license and CPR, ACLS and Pals certification. All qualified applicants will receive consideration for employment without regard to race, color, religion, gender, national origin, age, disability or veteran status. 1104 West 8th Street Yankton, SD 57078 1104 West 8th Street Yankton, SD 57078 IF INTERESTED, APPLY ONLINE AT: www.YanktonMedicalClinic.com/careers IF INTERESTED, APPLY ONLINE AT: www.YanktonMedicalClinic.com/careers SOUTH DAKOTA HUMAN SERVICES CENTER SUMMER INTERN POSITIONS Pharmacy $15.10/hour Occupational Therapy $15.10/hour Nurse (8 positions) $14.10/hour Counseling/Social Work/Psychology (6 positions) $10.70/hour For more information go to http://bhr.sd.gov/workforus. 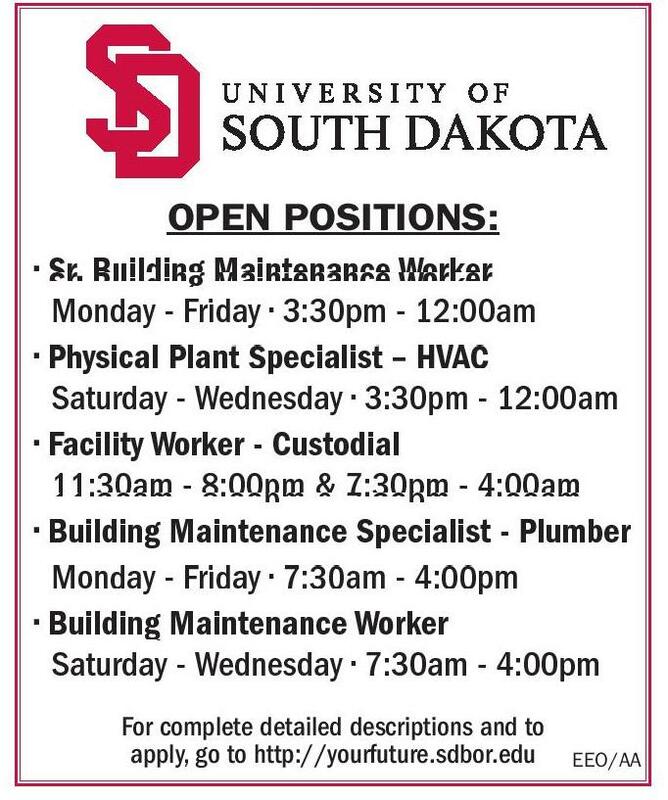 Call 605-668-3118 Open pOsitiOns: • Sr. Building Maintenance Worker Monday - Friday • 3:30pm - 12:00am • Physical Plant Specialist – HVAC Saturday - Wednesday • 3:30pm - 12:00am • Facility Worker - Custodial 11:30am - 8:00pm & 7:30pm - 4:00am • Building Maintenance Specialist - Plumber Monday - Friday • 7:30am - 4:00pm • Building Maintenance Worker Saturday - Wednesday • 7:30am - 4:00pm For complete detailed descriptions and to apply, go to http://yourfuture.sdbor.edu EEO/AA Why settle for just a slice … Switchboard Operator: Full-time position Monday through Friday and rotating Saturdays. Will operate clinic switchboard and provide support with payment entry for business office. Must have excellent computer and communication skills. Attention to detail mandatory. Medical office experience is preferred. All qualified applicants will receive consideration for employment without regard to race, color, religion, gender, national origin, age, disability or veteran status. Application Deadline 1/6/19 JOB OPPORTUNITY Manager Trainee Income Opportunity 1360 When It 1104 West 8th Street Yankton, SD 57078 IF INTERESTED, APPLY ONLINE AT: www.YanktonMedicalClinic.com/careers FULL-TIME REPORTER The Yankton (S.D.) 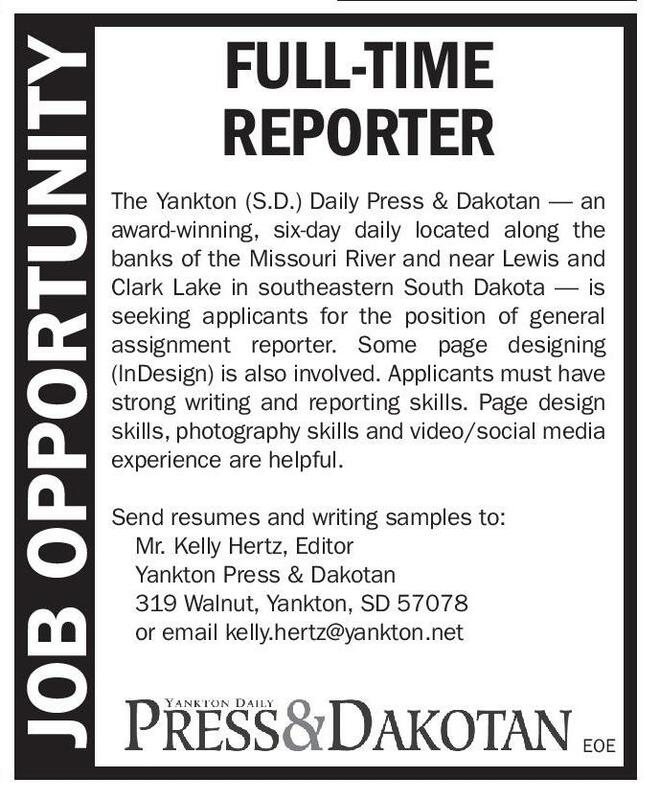 Daily Press & Dakotan — an award-winning, six-day daily located along the banks of the Missouri River and near Lewis and Clark Lake in southeastern South Dakota — is seeking applicants for the position of general assignment reporter. Some page designing (InDesign) is also involved. Applicants must have strong writing and reporting skills. Page design skills, photography skills and video/social media experience are helpful. Send resumes and writing samples to: Mr. Kelly Hertz, Editor Yankton Press & Dakotan 319 Walnut, Yankton, SD 57078 or email kelly.hertz@yankton.net Reception/ Medical Records: Immediate opening for full-time (40 hours per week) receptionist/medical records at the Vermillion Medical Clinic. Schedule includes Monday through Friday. Applicant will be trained for ConvenientCare clinic reception. Duties include registering patients, scheduling appointments, answering patient billing and insurance questions, and serving as a liaison between patients and medical support staff. Medical records processing and duties associated with medical records. All qualified applicants will receive consideration for employment without regard to race, color, religion, gender, national origin, age, disability or veteran status. When 100% of your retail market receives The Broadcaster. The Broadcaster is the primary medium successful businesses have used to reach their customers for over 50 years. Your Broadcaster carries more advertising than all other local media combined. And, like our customers, we continue to grow. When 100% your retai market receives Th Broadcaste The Broadcaster primary mediu successful businesses have used to reac customers for ov years. Your Broad carries more adve than all other local combined. And, li customers, we continue to g Broadcas Press 201 W. Cherr 624-4429 1x10 1104 West 8th Street Yankton, SD 57078 EOE Why settle for just a slice … Broadcaster Press IF INTERESTED, APPLY ONLINE AT: www.YanktonMedicalClinic.com/careers 624-4429 201 W. Cherry St.